When I had a friend who worked at a Japanese restaurant tell me that "they make like, the BEST Japanese, like, ever", I was no longer looking at a friend. I suddenly saw the world's best employee standing in front of me, voluntarily doing free promotional work for their boss. How much are they getting paid to do this? I wondered in my head. That is a daring claim, especially coming from a foodie - one who is always on the pursuit to find food that makes the best not the best anymore. How much truth was in their words? And about 6 months later than intended, find out I did. And that's half a year too late, of missing out on, like, the best Japanese, like, ever. After quizzing our waitress on the difference between their dishes Salmon Sashimi and Toro Salmon Sashimi, we then felt a little less ignorant and proceeded to settle with the latter. 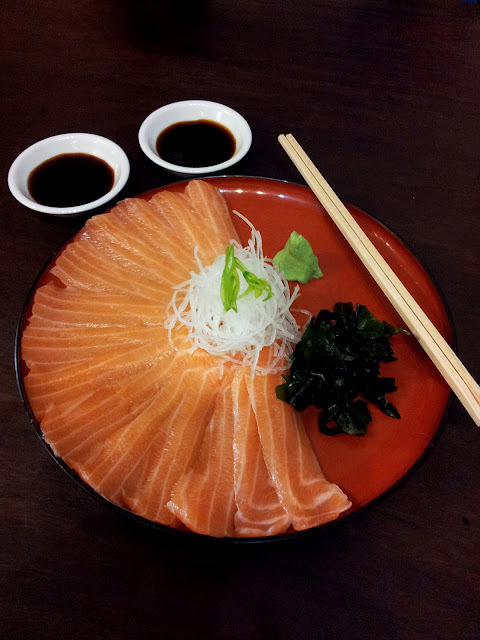 Their salmon sashimi was a satisfying starter on our last visit, which called for another raw fish dish this visit. An enticingly good looking plate of salmon belly sashimi arrived, and it took a lot of restraint to not be all over it the second it came! In comparison, the difference between this and their normal plate of sashimi...is how good this one is. Slightly more expensive, but the toro salmon sashimi gives you more by the slice but less by the width. The long, thin strips are exquisitely smooth with lines of fat embedded into the flesh, melting in your mouth as you slowly savour each slice. I know I tried my hardest to drag out the time it took to eat this! If it helps with the sensory side of things...it's like getting passionate with a tongue. Ha! There IS rice under all that! As the Deluxe Bento Box comes without rice, there is the option to add a bowl of rice with all the extra flavouring on top for just 50 cents. 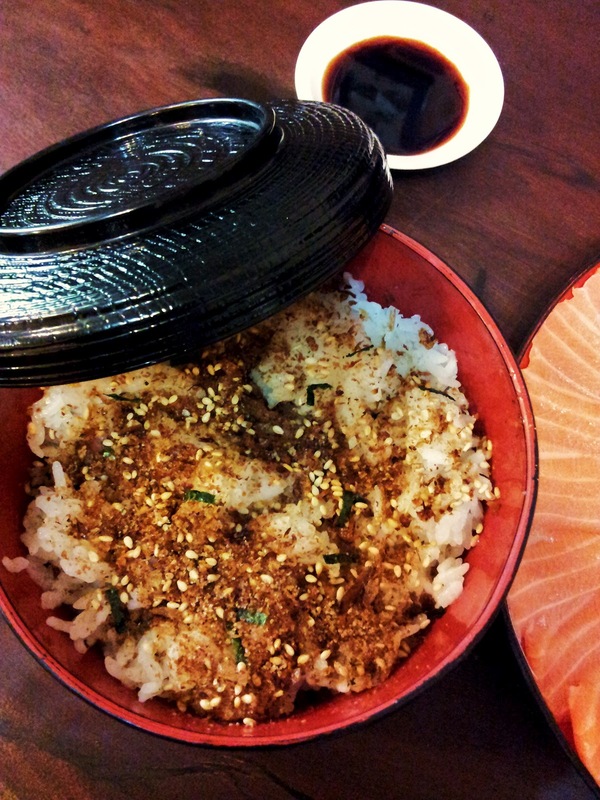 It gives a big oomph to plain steamed rice, with the generous hand of seasoning shaken on top. A wonderful blend of salt, sesame seeds, nori flakes and other delicious tasting things that make that fiddy cent worth every cent. And if you are starving (which is the thing I happen to feel my whole life), Ohnamiya's Deluxe Box is a great way to splurge for your appetite without splurging from your wallet. This two level extravaganza is served in a two tiered box complete with a lid, which presents a whole party of different foods in segments when disassembled. Following all the anticipation of the dramatic box opening scene, the prawn katsu features golden breaded deep fried prawns served with 2 sauces, mouthfuls of bean sprouts, seaweed and shredded carrot, mixed sushi rolls, dressed cabbage salad, half boiled egg, agedashi tofu and sesame chicken. What a mouthful! And what DELICIOUS mouthfuls indeed, of the variety that comes in this box. 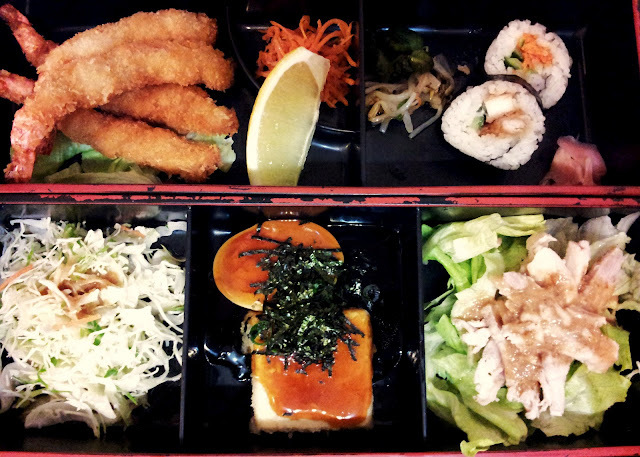 You don't always see all this in a standard Japanese bento box at restaurants! 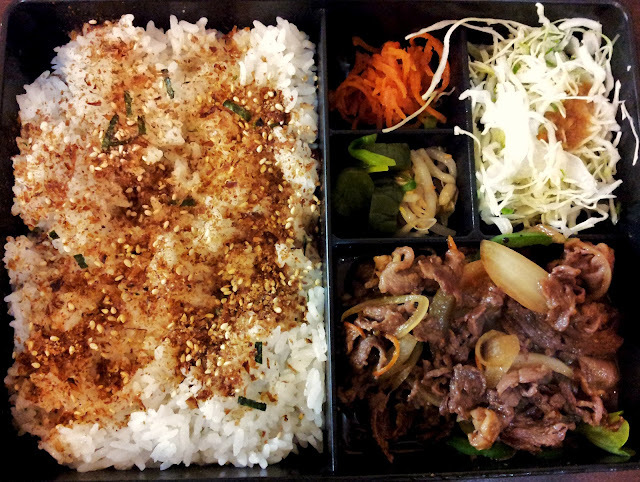 Not feeling particularly adventurous that evening, I settled with the humble teriyaki beef rice box, even after swearing to myself NOT to get teriyaki anything. This is your standard teriyaki bento box that doesn't make all the noise the deluxe box makes, which comes with all its bells and whistles attached. As a rice lover, I am quite thrilled at the disproportional serving of carbohydrates to protein and vegetables. With seasoned rice taking up exactly half of my boxed dinner, I still manage to finish the rice before slowly trudging through the rest of the beef, which there is still quite a lot of left. The cabbage, carrot, pickles and bean sprouts are in neat, compartmentalised servings next to the "grilled slice beef". If it is grilled, it is certainly a shame that they no longer have that grilled taste after being drenched with teriyaki sauce. Salmon sashimi at Ohnamiya certainly does not disappoint. 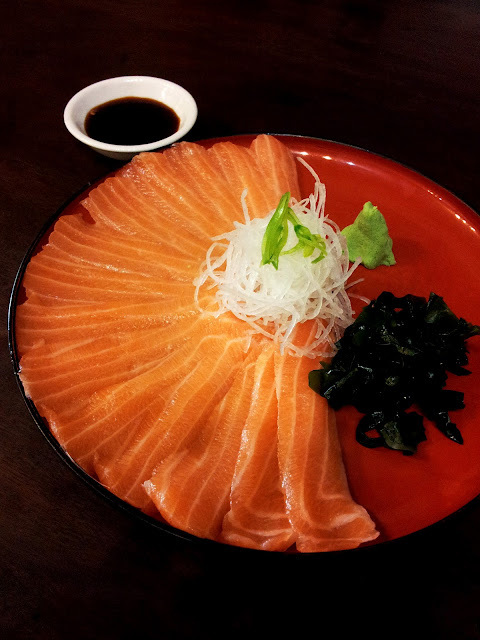 The thick, luscious slices of sashimi have that fresh sweet taste and gives a good firm chew, making it the best kind of appetiser before a big Japanese dinner to come. All rice boxes are set out in the same way, and differ in the protein choice you choose to go with it. I usually associate salmon with images of silky, smooth and moist pieces of flaky goodness. I always wish to see other methods of preparing salmon besides with teriyaki, but to no avail. Ohynamiya's grilled salmon glistens with a teriyaki glaze on the surface, while sitting in a shallow pool of the sweet syrup. Unfortunately, the pieces are sliced on the thinner side of thin, and suffer from the dreaded overcooking consequence from tasting dry and rough in the centre. But you know, since salmon is the best thing and all, forgiving and forgetting is easy. Getting most excited over rice - that's a first! Give me a bucket of steamed rice (and an equally big a bucket of this seasoning) any day! And although it is unlikely one would even remotely picture Japan whenever the word "curry" is mentioned, that is a thing that needs to change, for your own taste buds' sake. Those Japanese make a damn fine curry, and although not as heavily flavoured with rich spices and hotness, the lighter tasting curry makes you see the usually dark, sludgy food from a new dimension. Here the chicken katsu curry is not served to you as a curry, but rather more as a simple plate of rice and freshly deep fried, crispy, poppin' hot pieces of tender chicken. All the more better this way, as you can decide for yourself whether this is too good to eat on its own, and end up deciding to omit the curry sauce altogether. Although both are golden and deep fried, there's a certain innate feeling that reduces the guilt from chowing down on Japanese katsu chicken served on a plate rather than the KFC kernel's original recipe chicken served in a big red bucket. This is the stuff inside the gravy pot that puts Aladdin's Magic Lamp to shame. I'd be heck happy to have a lamp that magically had curry appear in case of emergency whenever I rubbed it! Served in a huge ladle like pot for clean, easy pouring and thorough curry sauce distribution throughout your plate of chicken, the thick and chunky curry gravy is there when you need it, and not there when you don't need it (for example, when you want your chicken crispy and your steamed rice white). Makes perfect sense, to order chicken curry, but having the option to only turn it into a chicken curry when you want it to. This way, you don't need to be eating a softened, mushy mouthful of messy curry. Instead, you are able to pour sauce over and instantly tuck into a mouthful of simultaneously warm, chunky and crispy ingredients from the sauce, vegetables and golden breadcrumbed chicken. One of the theories I faithfully stand by, is that no dinner is ever complete without a generous serving of dessert. It is only well and truly satisfying when you've hit the point where you feel like the size of a baby elephant. With a small but delicious selection of desserts, it's hard to say no, even if your pants have gone noticeably tighter. A more simplistic choice is this cylindrical mound of black sesame ice cream served with a dollop of softened azuki beans and a glazed cherry. Although not having the conventional gritty black colour of sesame flavoured desserts, the ice cream still has that distinct sesame flavour. Intensity of it could always be a bit (a lot!) more. As always. The grand finale finish to a satisfying dinner is to cater to your sweet tooth that's been fed with vast amounts of salty fried chicken and other savouries. Served on a small saucer, the panna cotta is heart-achingly small in stature but has a perfectly silky wobble. I prod it once, twice, three times, and then went into mass destruction mode. So this panna cotta are all my fantasies coming together, and little did I expect to find it in a humble suburban Japanese eatery. The lusciously light and silky dessert holds a consistently smooth texture throughout and the green tea infused cream means it's not overly sweet. The overall green colour does not lie, and stays true to your expectation of a strong, intense matcha flavour. The darker layer on top is especially rich and full bodied with slightly bitter undertones, which is easily balanced out with the creamy, sweet moat of custard that protects that green castle - equally as majestic as it is fragile. Amongst the food, the food, the dessert, and the food, what I love about this place is the unpretentious vibe that sets the icing on the cake. Unlike other places that charge for water and a measly watered down cup of green tea, Ohnamiya struts their generosity and provides free flowing liquids that you can help yourself to. Just not the alcoholic kind! Although a perfectly located Ohnamiya sits on Hampden Road at my convenience, I am inclined to make the trek to whoop whoop (i.e. South of river) to get a good feed from the Ohnamiya from down under. The place is bigger, brighter and rowdier (for the better)! A most notable mention goes to the waitresses there, for their attentive - perhaps overattentive service. While we appreciate how much attention we were receiving, you'd agree having 4 different staff within the time span of 4 minutes popping by to take your order a bit excessive right? Haha, it didn't bother us one bit, and it's nice to know someone is standing by, ready when we were. Getting attention certainly beats trying to get attention! It was pleasing to see service is observant and efficient, out on the floor and in the kitchen. Meals come out swiftly and speed is not compromised with quality whatsoever. Ohnamiya provides hearty meals at reasonable prices that won't make you think twice when it comes down to ordering yourself a feast. The ambiance here is a casual comfortable dining atmosphere, with simple furniture and decor sporting a wooden theme. Signage on walls encourage you to abandon your seat when you're done to other waiting customers so lingering is probably not looked upon favourably! And on both occasions of visiting, we happened to be seated at the exact same table and causing that unmistakable feeling of deja vu. But of course, I knew with certainty that the second time around was not a repeat of the first, for I ordered a completely new dish. For the unwritten rule here is you simply do not, should not, would not and could not stick with one dish at Ohnamiya. Shouldn't you love me for that? I thought it was Kido's sashimi that gets you excited, not Ohnamiya's?